Today we’re talking about different aspects of dirt and how it shows up in our lives. It’s really not a serious topic, but we are surrounded by it, so it plays a big part in our lives. Did you know that chickens love dirt? 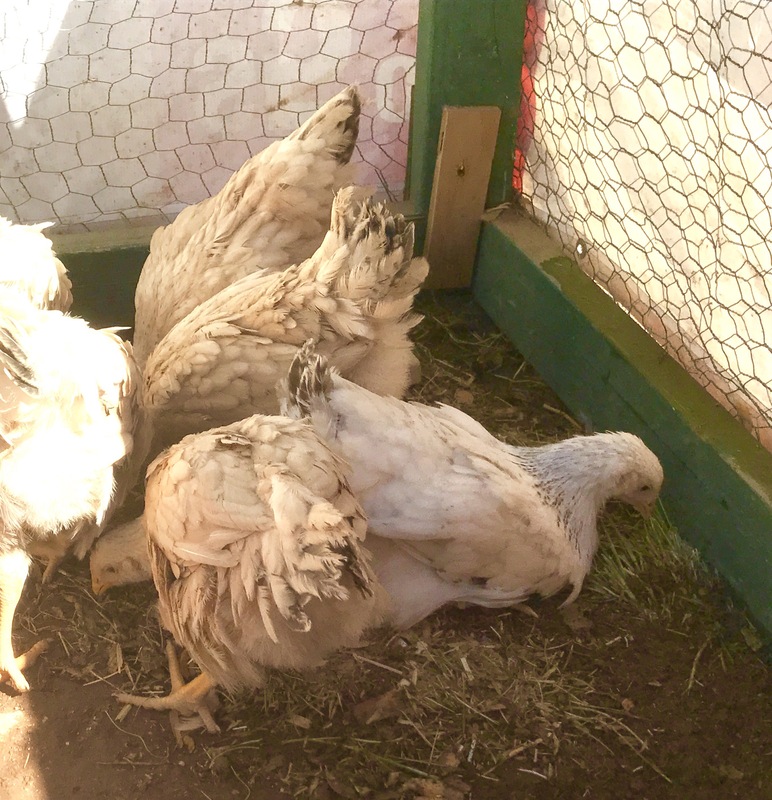 They take dust baths on a regular basis – this helps control mites and live. The photo on the left shows brown little chickens who were, just moments before, pristine white little chickens. They could not get enough of the dirt today. It was pretty darn funny. Even the littlest Littles, the Specks, have been enjoying the dust bowl that Sue gave them in the kennel. I tried to get a close up photo, but this is the look I kept getting. They like their privacy while bathing, thank you very much! We changed Roman’s and the Ducks’ pools today because they were just filthy. The wind was blowing dust all around, the birds were tracking it in every time they climbed into the pools- it was time for fresh water. We should have taken a short video of them playing in the cool, clean water. They were just ecstatic! Such fun to watch them play around. Good for the soul, smile time. Another dirt issue today: Sue broke her shovel while digging up the coyote melon tubers. Just snapped completely in half! Granted, it was one of the very old shovels – but still! Right in half! Had to purchase another one today, was probably time. Today, on the advice of a friend who visited recently (thanks Barb and Greg, for coming to see the homestead! ), Sue decided she’ll use the back hoe to dig up those coyote squash tubers. Fun and productive! Final dirt issue today: Sue had been moving unwanted dirt from a neighbor about a half mile away to help refill the ditch that she dug when the electrician was running line to the dinky house. She had to find dirt to help fill because there were just so darn many rocks in the ground that, once you remove them, there wasn’t enough dirt to completely re-fill the ditch. Well, our neighbor thought he’d be able to enlist another neighbor to use his dump trailer, but today that neighbor said, “Sure, at $20 a load.” So, Sue said, no thanks – I think I’ll just use horse manure. Our friend Mr. Kelly will gladly give us his horses’ manure any time! So, no more dirt hauling. Today’s Weather: It was back to beautiful. No wind, just a slight breeze. It was 50° at 5:30 this morning, but warmed nicely. We just came back from dinner in Sierra Vista where it was 81° at 7:00 p.m. It’s begun to cool down quickly now with the sun gone to sleep. Egg Report: Only 6 today, but we had 8 eggs yesterday and 10 on Saturday. Mama is still sitting on the two Easter Eggs. We gave them to her on the 23rd of April, so it’s been one week, only 14 days – there abouts – before we see if anything comes to pass.